For the 9th straight month last month, foreclosure activity slowed. According to foreclosure-tracking firm RealtyTrac, the number of foreclosure filings dropped 29 percent nationwide on an annual basis in June. The phrase “foreclosure filing” is a catch-all term, comprising default notices, scheduled auctions, and bank repossessions. June marked the ninth consecutive month of sub-300,000 filings after 20 months above it — a promising signal for the housing market in Tennessee and nationwide. 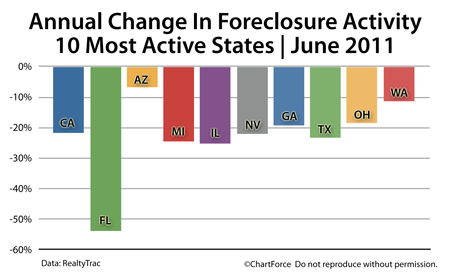 It’s also noteworthy that each of the 10 most foreclosure-heavy states showed fewer foreclosures in June 2011 as compared to June 2010, led by Florida’s 54% decline. Florida is one of 4 states on the leading edge of foreclosure activity since 2007. The decrease in foreclosure filings comes at a time when buyer demand is highest. According to the National Association of REALTORS®, “distressed properties” account for more than 30 percent of all home resales and no wonder — homes in various stages of foreclosure or sold by short sale are selling with discounts of 20 percent versus comparable non-distressed homes. For buyers in search of foreclosures in the Murfreesboro area , talk with a licensed real estate. Buying homes in foreclosure follows a different process path as compared to buying a “traditional” home. Make sure you seek the help of a professional.